How are you meant to charge your phone regularly or stay up to date on global events if you live in the middle of nowhere? Well, in parts of Turkey, you can rely on donkeys. These energy-carrying animals have solar panels on their backs, and as they travel around, are allowing local nomads to plug in and surf the web. In Turkey, there are numerous remote communities who live “off grid”, but who are slowly moving into the digital world via cell phones and laptops. 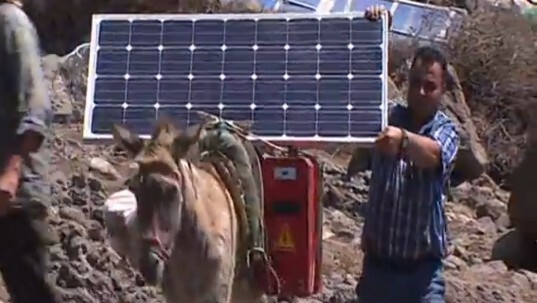 As such, the government has started a scheme to provide them with the latest solar technology… using donkeys. The scheme is led by Turkish solar panel company Ser-Gün, who have produced solar panels that can provide between five to seven kilowatts of electricity which is enough to charge cell phones, laptops and also to power up lights in the evening. The solar panels, which are connected up to a “plug-and-play pack” cost approximately $1,300, but the government subsidises half of the cost. It is all part of an on-going company strategy to improve the comfort and sustainability of the shepherding trade. According to a BBC report, the donkeys have been able to transport the equipment to remote locations, giving nomads not just power, but also access to the Internet. It is hoped that as the technology improves, the panels will become more compact, thus improving ease of transport.